‘Abandon hope, all ye who enter here . . . ‘ | A balanced diet . . .
Well, that was what I thought. Until a few days ago, that is. On the outskirts of Southwell (pronounced Suthell, or more precisely /ˈsaʊθwɛl/or /ˈsʌðəl/) in Nottinghamshire there is a large redbrick building standing in about six acres of land. This is The Workhouse (or Greet House), beautifully stark in its Georgian symmetry. 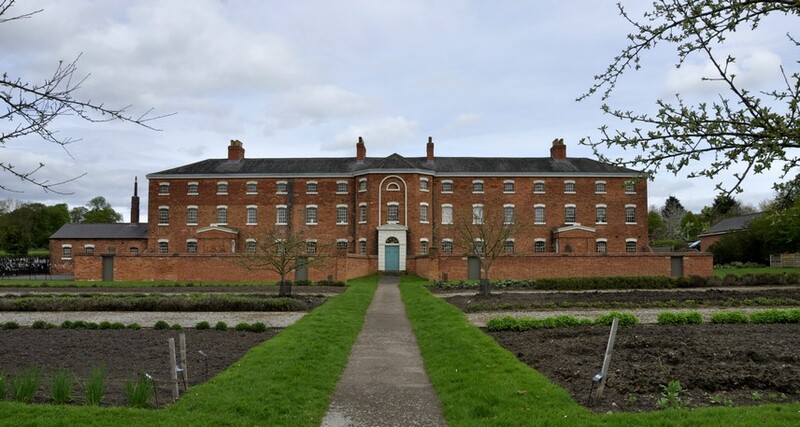 Built in 1824 during the reign of King George IV, The Workhouse was ‘home’ to about 160 destitute men, women and children who were provided with ‘Indoor Relief’. The cost of providing support, under the Poor Laws, to recipients in their homes (so-called ‘Outdoor Relief’) had become less sustainable. So the Workhouse was built at Southwell to provide shelter for a limited number of paupers, many old and infirm. Life in The Workhouse was no bed of roses, but maybe not as harsh as many others around the country, where everyone toiled in the most appalling conditions. But shelter and food was provided, and both boys and girls received a basic education, learning to read and write, and do sums. 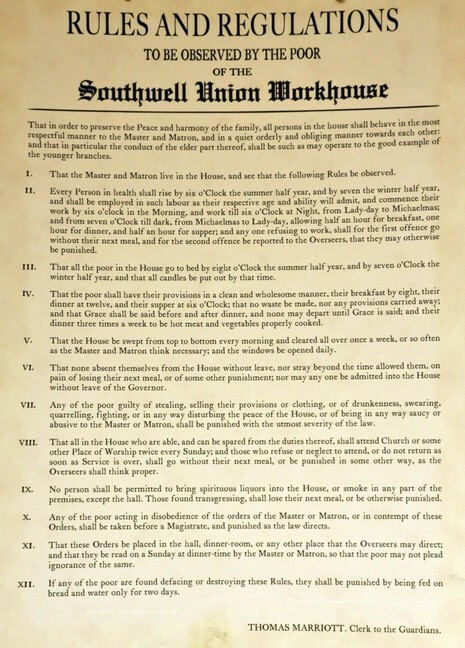 No doubt the workhouse regime changed from time to time, as each new Master was appointed and took control of their lives. The Master and his family lived in a suite of rooms above the main entrance. The Workhouse at Southwell was featured in Episode 4 of the second series of Secrets of the National Trust broadcast recently on Channel 5, and presented by Alan Titchmarsh. I have to admit it presented such a despondent scenario, a visit there didn’t seem very appealing. Consequently, Steph and I decided we wouldn’t make a special visit there, but combine it with another trip in the vicinity. And, as it happened, a diversion to Southwell last Monday added only a few miles to our return journey to visit our younger daughter and her family in Newcastle. I mentioned my preconceptions about The Workhouse (based on the Titchmarsh program) to one of the volunteers. From what he told me, it seems that Titchmarsh wanted to present a more balanced picture of life in The Workhouse, but the series producer somewhat ‘over-egged the doom-and-gloom pudding’ story of The Workhouse. As I said there’s no denying that life inside was tough for the inmates. Life would probably have been tougher on the outside. Now, having made a visit to The Workhouse I am so pleased that we did. 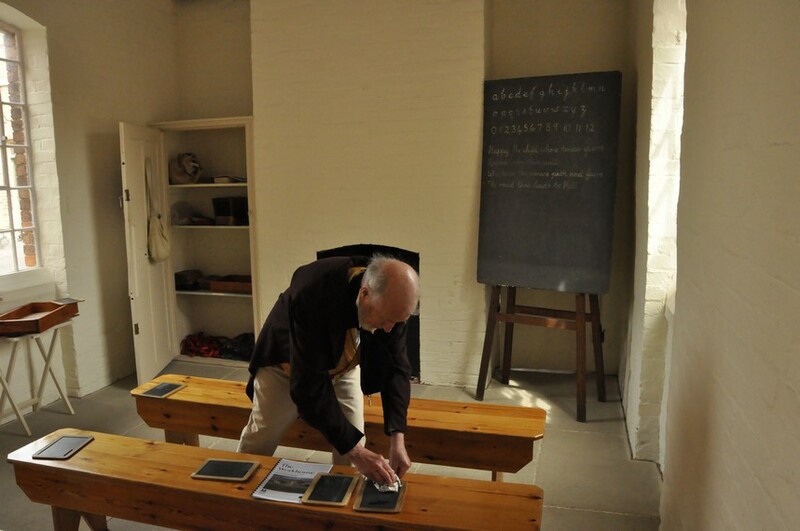 It was revealing, interesting, conscience-pricking (although it’s not altogether appropriate to judge what The Workhouse stood for by today’s standards), and the National Trust volunteers (mostly in contemporary costume) brought the story of The Workhouse to life and made the visit even more enjoyable. They were very convincing, particularly the skivvy in the cellars who answered all my queries, in character. 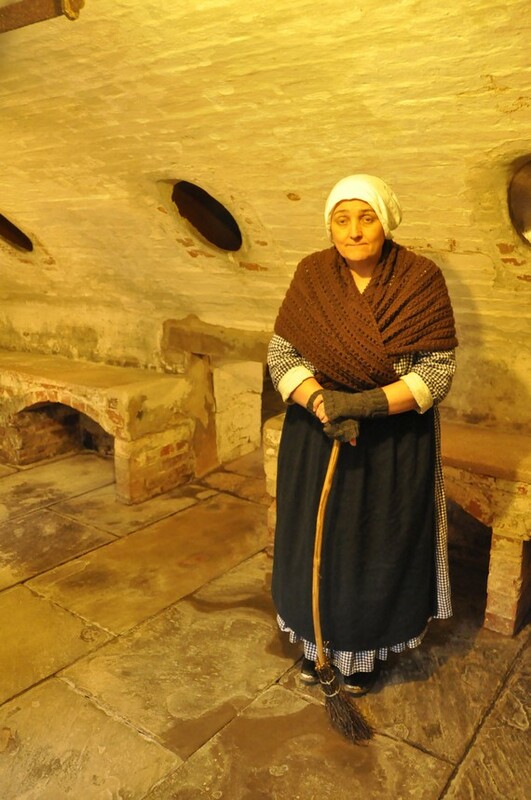 The Workhouse consists of a three-story main building (with cellars), divided into separate sections for men and women, and able-bodied or old and infirm for each. Each group had its own exercise yard, with a privy in the corner from which ‘night soil’ was collected as manure for the garden. Plan of The Workhouse. (5) is the National Trust entrance; (6) is the wash-house; (8) is the garden. The exercise yards can be seen either side of the main entrance to The Workhouse, with a privy in one corner of each. There are now gaps in the wall between the exercise yards to facilitate the flow of visitors. (4) is an assembly point for guided tours. 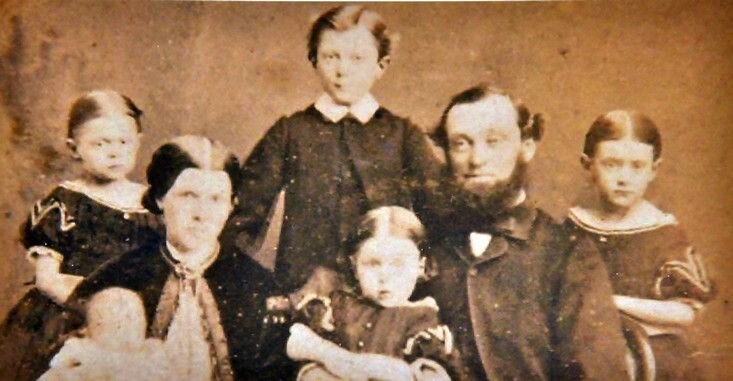 Husbands were separated from wives, and children from their mothers beyond the age of two. In the children’s dormitory, the glass in the windows (at least the lower panes) was frosted so they could not look at and see their mothers working in the yards below. A block of outhouses to the rear of the main building contained the laundry, a bakery, and the ‘dead’ room. Water was collected from the roof, and stored in a 160,000 gallon storage tank underneath the kitchen. Food was stored in the cellars. 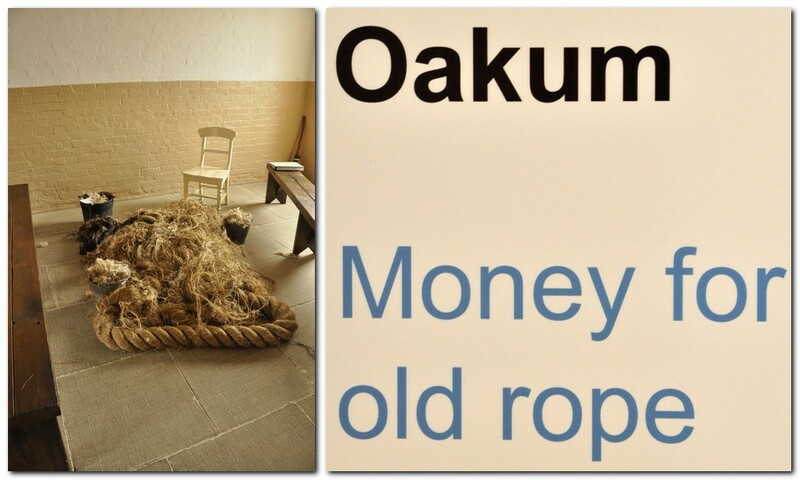 Able-bodied men, who were unemployed outside The Workhouse, were considered lazy, and set to work on menial tasks such as unpicking old ropes or oakum. The old and infirm often had no work to do. The various dormitories were on the first and top floors. Many of the upper rooms have deteriorated and are in urgent need of conservation. What is remarkable is that The Workhouse was still being used as an emergency shelter to house homeless families, in the so-called ‘bedsit’, as late as the 1980s. If walls could talk, what tales they would tell us. But in the able-bodied men’s exercise yard (on the right on the panorama immediately below), and presumably out of view of the Master, at least one of the inmates did leave a legacy of their days in The Workhouse. 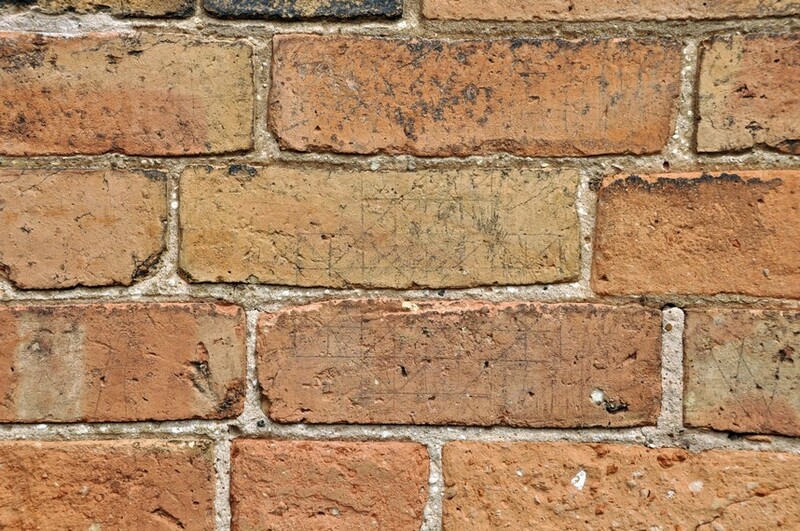 Clearly etched on several bricks, someone has marked off the days. It’s hard to imagine just how tough life must have been for the inmates of The Workhouse at Southwell. Surely it cannot have been worse than what they had endured, penniless and hungry, outside. With the enactment of the Poor Laws, society provided (limited) support for those who had fallen on hard times. In many ways, society has a lot to answer for today. This entry was posted in Out and about and tagged National Trust, Southwell, The Workhouse.